Tis' the season to be jolly, and who wouldn't be jolly with the opportunity to review the FIC K8-800T motherboard. 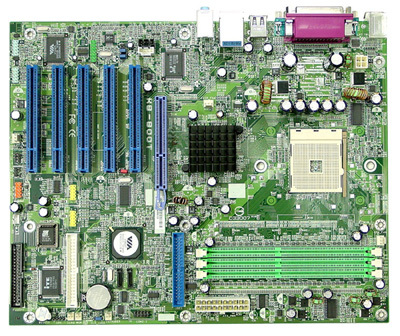 The K8-800T is FIC's first, and currently only, motherboard that supports the AMD Athlon 64 3200+ (Socket 754) processor. If you haven't heard about the new 64-bit processors from AMD I highly suggest you do two things. First, get out more- this stuff is the future of computing, don't get left behind. Secondly, read this article from Anandtech.com that talks about the K8 architecture in very good detail. Sadly, we weren't able to get a our hands another K8T800 or nVidia nforce3 motherboard to compare against the FIC motherboard, regardless, benchmarking results will still be reported in this review. Hopefully SLCentral will get obtain another board soon. Enjoy. The FIC K8-800T is built with the VIA K8T800 chipset and I think we should take a look at its features and how it compares against the NVIDIA nForce3-150 chipset. The biggest difference between the two chipsets is that VIA went with the classic North and South bridge architecture while NVIDIA compacted their chipset into a single chip. Of course, NVIDIA was able to do this because of AMD's decision to include the memory controller on the CPU. Since the memory controller is a part of the processor, a large portion of the chipset's responsibilities were eliminated and that is why NVIDIA went to a single chip solution. Which one was the better choice? Well, VIA points out that they are the only chipset to support fully the full-speed 800Mhz (1.6GHz) Hypertransport bus, which is true. VIA also claims that others cannot yet implement 800 Hypertransport because of excessive circuit noise. In order to deal with their problem, the competitors have had to either decrease the bus speed from 1.6GHz to 1.2 GHz or halve the size of the data packages from 16 bits to 8 bits. The following diagram found on VIA's website demonstrates this idea. So VIA's chipset is better since it is faster, right? Not if NVIDIA has something to say about it. They (NVIDIA) fireback at ATI's claims and point out that there is a 533 Mb/sec bottleneck between the North and South bridge of the K8T800 chipset, thus the higher Hypertransport speeds are negated. NVIDIA continues to say that their single chip chipset is faster because it runs at 600MHz DDR (1.2GHz effectively) which is faster than VIA's two-chip setup. The only way to find out which chipset is faster is of course to run some benchmarks. 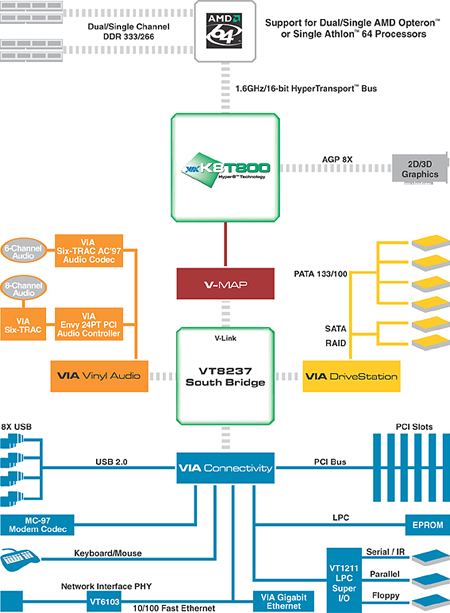 Below is a block diagram of the K8T800 system. 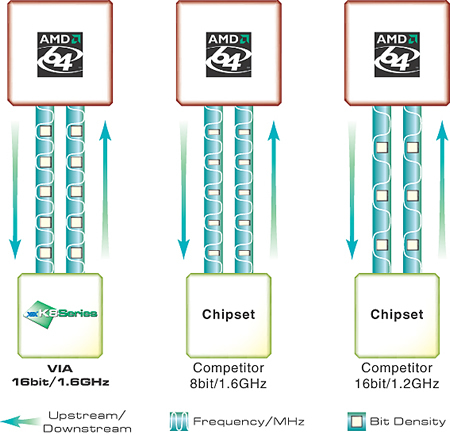 VIA's unique Hyper8 technology eliminates noise on the HyperTransport link between the processor and chipset, enabling the industry's only full-speed, full-spec 16-bit/1.6GHz implementation of the processor-to-chipset HyperTransport link. To best exploit the rapid pace of innovation in the PC industry, particularly with reference to I/O technology, VIA have opted for a classic North/South Bridge configuration allowing for the most scalable mainboard design, enabling new functionality to be integrated in an expedient and practical manner, thus providing the fastest time to market with new features and system performance enhancements. The VIA DriveStation™ Controller Suite with native dual channel Serial ATA/RAID controller, provides direct support for two 150MB/s Serial ATA devices and its unique SATAlite™ interface expands support for two additional SATA devices. The V-RAID controller features native RAID 0 & RAID 1. The user friendly V-RAID software interface enables easy disk array configuration and management. Delivering rich, warm surround sound at resolutions as high as 24/96 through up to six- or eight-channel outputs, the VIA Vinyl Audio 5.1 surround sound and VIA Vinyl Gold Audio 7.1 surround sound enables crisp, clear performance, representing the highest levels of audio quality in a mainstream integrated or onboard solution. VIA's unified approach to drivers has been established for eight generations of chipsets, allowing end users to benefit from seamless hardware and software compatibility. The biggest problem with this motherboard are the overclocking limitations of the BIOS. The K8-800T uses the classic Phoenix-Award BIOS but the only overclocking options available are adjustable CPU voltage, memory voltage, and AGP voltage. It is missing options such as the clock multiplier, memory timings, and the AGP/PCI clock. Without the clock multiplier the only way to overclock is via FSB speed settings. Once again, I'm sorry about not having another K8T800 or nforce3 motherboard as a reference. I think most of the benchmarks are self-explanatory, one you may not have seen before is Real Storm. Real Storm looks like a gaming benchmark, but it is far from it. This is from their website: "The RealStorm Benchmark 2004 is a software rendering benchmark which will measure the performance of your pc-system. Processor speed, memory speed, cache type/size and mainboard chipset will have big effect on the performance of your system. This benchmark is NOT for comparing the speed of your 3D-accelerator, as it won't use it at all." All in all, the FIC K8-800T is a very solid board and is also amongst the cheapest of the current Socket 754 motherboards. The benchmarking results good, but after reading several reviews of other K8T800 and nforce3 chipset motherboards, they definitely aren't the fastest out there. This is obviously due in part to the BIOS and its limited overclocking capabilities. If the restrictions were rid of, then the FIC K8 would surely be a top competitor for 64-bit motherboards. Aside from the overclocking issue, the Phoenix-Award BIOS is an excellent BIOS with many great options. The K8 also has a lot of solid features like on-board audio and lan, and extra brackets for firewire and USB. Bottom line is if you're looking for a "bang for your buck" mobo, then this one is the way to go. And once a 'wilder' BIOS is available, this board will likely be amongst the cream of the crop. Big thanks to FIC for providing a unit for review- get some overclocking into that BIOS and you have yourselves an editors choice.